Google AdSense is an advertising platform for publishers, which has so far been the top choice for Bloggers. This ad platform developed by Google is becoming the most popular among Websites. Millions of ad publishers have joined, with billions of dollars of transactions per day. But, did you know that a lot of platform of website advertising provider besides Google AdSense? They also offer attractive revenue sharing, of course, with different types of ads and different revenue sharing. Among them are Taboola, Chitika, Bidvertiser, etc. From hundred ad platform, there are also support for ad serving on Google AMP HTML-based websites. Now I will review the best Google AdSense alternatives that support AMP HTML based websites. Taboola is one of the largest native advertising providers. Already many advertisers and publishers are joining Taboola. For publishers, Taboola provides several types of AD, including Native Ad, Ad Feed, Video ad, etc. Taboola is willing to pay you up to 70% revenue sharing. In February 2016, shortly after AMP Project released AMP HTML, Taboola also announced that the ads they provided could be displayed on Google AMP-based websites.. Here's an example of a code format for Taboola publishers, which can be applied on the AMP page. heights="(min-width:1907px) 39%, (min-width:1200px) 46%, (min-width:780px) 64%, (min-width:480px) 98%, (min-width:460px) 167%, 196%"
Learn more about Taboola Ad Implement, Click here. Media.net is known as an advertising provider of Yahoo and Bing, the great giant in technology. Currently they have millions of publishers and advertisers. Media.net provides many types of ads that you can post on HTML websites and AMP HTML based websites. Some of the types they provide include: images, rich media, videos, expandable etc.. This is an example of an ad placement format, for Media.net publisher, which can be applied on the AMP page. Learn more about Media.net AMP-Ad Implement, Click here. RevContent has similar features to Taboola, they provide native ad and feed ad types for their publishers. RevContent can be your alternative using the AMP Blogger Template. RevContent also provides interesting Ad Feeds, and does not make your website slow when accessed. Here is an example of amp-ad format for publisher RevContent that can be applied in the AMP page. heights="(min-width:320px) and (max-width:480px) 440vw, (min-width:480px) and (max-width:768px) 110vw, (min-width:768px) and (max-width:1280px) 70vw, (min-width: 1280px) and (max-width: 1600px) 45vw, (min-width: 1600px) 40vw, 150vh"
learn more about RevContent AMP-AD Implement, Click Here. 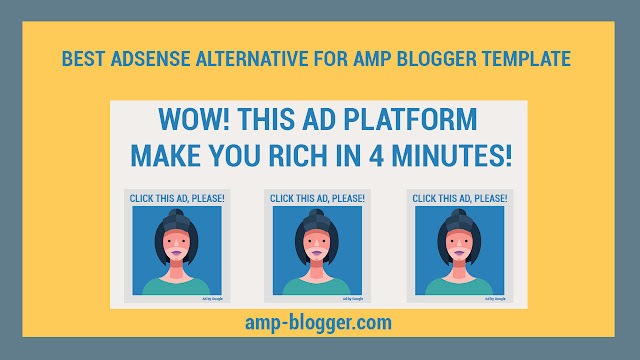 Here are some AdSense alternatives for you who have an AMP-based website. May be useful :).